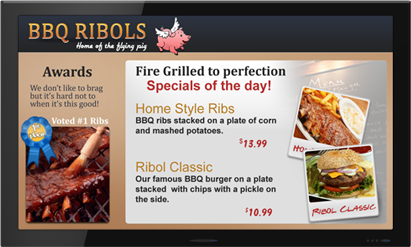 Digital signage for restaurants offers a number of advantages over traditional signs and menu boards. Using a digital sign or digital menu board can help restaurant owners and operators save time and money, ease marketing efforts, and make daily operations run smoother. A primary concern for many restaurant owners when considering the change to a digital signage solution is the initial cost. But with the cost of newer high-resolution TVs and commercial displays ever decreasing, and the costs of traditional signs and print media staying the same, digital signage offers a clear advantage. Another distinct cost advantage is that despite a larger upfront investment, restaurant digital signage equipment only needs to be purchased once. Old-fashioned signs and print media must be re-ordered and paid for every time a change is needed. With digital signs, changes can be made with a few simple mouseclicks and keystrokes. Since there's no need to keep ordering new media, the cost savings over time is enormous. Digital signage in restaurants can also make marketing efforts a breeze. Gone are the days of having to send your design to the printer and wait. If you want to display a new promotion in your restaurant, digital signage lets you quickly setup your promotion and push it to your display. Have a tasty new menu item? Uploading HD photo and video to a digital sign is a fast and easy solution to show it off to your customers. Many restaurants offer specials during different days of the week, or times of day. Promotions for daily specials, happy hour drink specials, and lunch or dinner specials can all be automated and scheduled to display at specific times using digital signage. Does your restaurant host live music or show sporting events? Make sure to let your customers know when the next band is playing, or remind them to stop in for a drink to catch the home team's next game. Since announcing new events like these requires constantly updating the information, this would not be practical for traditional signs. Digital signage makes this easy and is sure to grab people's attention. Did the price of one of your main ingredients just go up, forcing you to charge a bit more for some of your food items? Digital signage lets restaurant managers change menu board prices instantly, rather than taking a hit for the price difference, or make physical changes to a regular sign board. For those who can't always be at their restaurant, or those who manage a chain of restaurants, digital signage provides an easy solution to updating sign content. With a basic internet connection, you can easily update all your digital signs from anywhere. No more reaching or getting up on a ladder to change items on old-fashioned menu boards. The features mentioned above are available on most modern digital signage systems, however you should always check with the provider to make sure their products will meet your particular needs. Some features such as scheduling and accessing the digital sign software remotely over the internet may not be available from every manufacturer. Exhibio digital signage systems are capable of delivering all the solutions presented in this article. You can contact Exhibio here for more information. Power and surge protection is something that is often overlooked when deploying a digital signage system, especially in small or hasty setups. Just like PCs and other sensitive electronics, digital signage equipment requires protection from electrical impurities in order to run efficiently and prevent damage. When deploying new digital signs, taking the time to plan accordingly will ensure steady operation and long life from these devices. Sudden surges, power outages, and other electrical issues are a common cause for flickering displays, abrupt reboots of digital signage players, and burnt-out internal electronics. Problems like these can be a huge headache and generate costly repairs for businesses, but they can be easily avoided. Using an uninterruptible power supply (UPS) with a battery backup is generally the best solution for power protection. In the event of a power outage, not only will a UPS keep your digital signs running, it can even prevent you from losing unsaved data when editing or working on new sign content. However, these units can sometimes be too bulky or heavy to deploy efficiently in every situation. If a UPS is not suitable or unavailable for the digital signage application, using a basic surge protector is the next best thing. Surge protectors don't necessarily need to be the ordinary, long power strips either. If aesthetics or physical footprint are of great concern, mountable and more ergonomic solutions can be used. Smaller surge protectors are even available that can fit directly over standard power outlets. Exhibio has announced cutting-edge hardware upgrades across their full line of digital signage media players. The new units have been equipped with faster and more energy-efficient processors, allowing them to continue delivering today's most demanding digital content to clients' displays as effectively as possible. The compact M-500 model runs on a modern, dual-core mobile processor from AMD, while the more advanced X-900 and ST-200 models are now being powered by blazing fast quad-core Intel i7 CPUs. 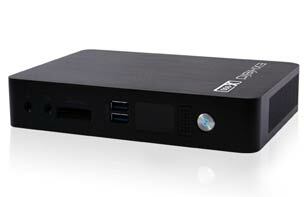 Solid-state drives (SSD) now come standard on all Exhibio digital signage players as well. SSD storage is faster, more reliable, and less power-hungry than traditional hard-disk drives. The new hardware changes also introduce a sleek, smaller form factor for each unit. Having a smaller physical footprint makes these systems easier and more convenient to deploy. “Exhibio is committed to making our digital signage players the fastest and most efficient available. Our new product line definitely puts us on top of the market in this regard,” said Greg Berner, Exhibio’s Sales Manager. For more information, contact Exhibio at 1.877.394.4246 or online at http://www.exhibio.com/. Digital displays are helping movie theaters increase profits by driving concession sales to customers before the show. The displays are attractive to movie goers, enticing them to make purchases they might otherwise pass up. Electronic message boards replace static signs and have become an integral part of concessions sales. They draw customers’ attention better and are more cost effective. There is no need to pay to have traditional signs printed and designed and replaced often as prices and promotions change. The ability to make real-time changes to pricing and menus also helps to save time and money for theaters. The network can be updated as often as needed, allowing theaters the flexibility to display special pricing or menu items at specific times of the day as well. With a digital network, once a design is selected it can be pushed to every location within minutes and all of the signage can be managed from a central location. The displays can also be customized to run region-specific promotions, pricing and menus. Advertising slots can also be sold to 3rd party advertiser in order to promote their brands in the concession stands. Digital displays also offer the flexibility to create one-time use menus for special events or exclusive screenings. Not only are digital signs increasing concession sales, they are also being used as a more efficient way to list show times, movie titles, ratings, ticket pricing and other information. Displays are able to show movie trailers and posters, which entertains customers in line and reduces their perceived wait time, making their experience in the theater more enjoyable. Airports are now using digital displays to reduce cost and work more efficiently for travelers. The digital network can be used for check-in kiosks, ticketing and gate computers and can be adapted to meet nearly every need of the facility. Gates and check-in locations can be assigned through the network and airport staff can automatically update them with the appropriate airline logo, carrier-flight listings and flight status information at the gate. Doing this allows more flexibility and gives personnel the ability to easily update airline assignments as conditions change. This eliminates the need for hard signs and printed material, reducing cost to the airport. Staff-facing terminals are vital to managing baggage flow, fuel, catering services and maintenance workers throughout the facility. Baggage handlers can easily find a flight and activate baggage directories while updating the displays located at each carousel from a central location, making it easier for traveler’s to locate their luggage. Wayfinding kiosks can also be set up throughout the airport, helping visitors find their way to the right location. Staff can also update flight and baggage information, display visual messages, and manage ticket counter assignments which increases their efficiency and can ultimately improve the passenger’s experience. Customs and Border Protection personnel can use a digital network to manage traffic flow and direct passengers to the appropriate lines, expediting processing through checkpoints. Displays can also carry multilingual messages to help route travelers arriving on international flights to baggage claim, customs, or help desks located throughout the airport. Electronic message boards can contain welcome messages and be easily updated with emergency alerts and weather information, keeping travelers well informed. In waiting areas, the digital network can stream live television to help reduce perceived waiting times which also helps to improve the traveler’s experience in the airport. They can also be used to advertise local events, hotels, car rentals, attractions and special promotions within the airport. Digital displays are now being incorporated in courthouses to provide important information and wayfinding to visitors. Electronic message boards located in the main entrance and lobby can inform visitors of security checkpoint procedures. These screens provide information on emptying pockets and handbag checks, as well as cell phone and weapon policies. These digital signs can also be integrated with existing case management and the daily docket to allow visitors to quickly find the information they need and continue to the proper location within the courthouse. This eliminates congestion and crowding in high traffic areas within the facility. By integrating with the courthouse’s current system, this digital network can also monitor caseloads and courtroom utilization to help the staff use space and resources more efficiently. Another important benefit to digital displays in the courtroom is that the system can be updated on the fly to display important alerts and emergency information. This helps to quickly inform staff and visitors of important evacuation or other safety procedures necessary to keep everyone safe. Digital signage screens are a welcome new addition in many sports venues. These networks are improving communication, engaging teams, team management and fans alike. Through the digital network, dynamic communication between management and players has never been easier. Trainers can easily keep players up to date on important messages, alerts, safety reminders and statistical information. The electronic message boards can be quickly updated, reminding players of team meetings, game strategies, opposing team weaknesses or even when it’s time to board the team bus to head to the next game. Web-based content, videos, highlights, league standings, individual player statistics and other custom message boxes can be displayed in locker rooms. Fans could also be allowed to submit messages to the team which can be shown as scrolling text on a display to help boost team morale. Public displays can keep fans up to date on team news, standings, highlights and any special achievements or titles won by their team or individual players. Digital signage advertising can be used to display special deals at concession booths throughout the venue or to promote upcoming team-sponsored events and programs. Hospitals and other healthcare facilities are using digital signage now to help improve the experience for patients and visitors. Digital displays can help reduce anxiety for patients and their families by providing information about the treatment before the patient undergoes the procedure. The content that is streamed can be specific for each department. For example, in the cardiology unit of a hospital, the display can educate patients on cardiovascular health and in the trauma unit, a display in the waiting room could offer comforting messages to families waiting to see a loved one. When placed in waiting rooms, digital displays help to reduce perceived wait times and make the waiting room experience more enjoyable by streaming educational and engaging content for visitors. This content can also promote new products or services, wellness and prevention events, classes and hospital sponsored screenings. Interactive touchscreen kiosks can be placed in waiting areas to help patients register upon arrival, fill out new profiles and update their information. These kiosks can also offer wayfinding with diagrams, interactive maps and step by step directions from one point to the next to help patients find their way around. Digital displays can also be placed in medical staff lounges to inform staff of policy and procedure changes, training opportunities, and other important notices. Electronic message boards in break rooms can also stream educational material, showcase doctor and staff awards and accreditations and help medical staff feel appreciated while keeping them up to date on important news. Electronic message boards can also be used to replace traditional whiteboards in nurses’ stations and operating rooms to improve efficiency, communication and coordination of nurses and doctors.